What is it about blue? I’ve been aware for quite some time that I naturally gravitate to the color blue. According to an article* I read late last year, half of the people on earth list blue as their favorite color. Granted, much has been written about color theory. When I was at the North Carolina Museum of Art again over the weekend, I made an intentional visit to Ellsworth Kelly’s Blue Panel. Each time I visit that painting, I try to view it from a new perspective. The work, a purely abstract blue panel, dramatically captured my attention during my first visit to the Museum’s new West Building in 2010. As I continued my museum visit this time, I challenged myself to become hyper aware of what initially draws me to a work of visual art. Usually, it is color that catches my eye first – and oftentimes, the color is blue. Blue Dancer, sculpted of bronze with a blue patina by the Ukrainian-born avant-garde artist, Alexander Archipenko, is another of my favorites. Wending my way through all the galleries, I notice that blue regularly lures me into a painting. The incredible blue sky above Georgia O’Keeffe’s Cebolla Church draws me in every time. I notice the sky first. Then, I am drawn in further to her unusual rendering of the church itself. The cool, dappled, blue light is what first lures me into Renoir’s double portrait, The Daughters of Durand-Ruel (on temporary loan here from the Chrysler Museum of Art). I recently enjoyed the biopic, Renoir, so this work has a current appeal for me. Blue was its initial draw, however. The same thing happens when I shop for clothing or home goods. Blue draws me to an item first. Then, I notice shape and texture. As a designer, rather than simply using blue to be agreeable (blue is everybody’s favorite color, after all), I’m going to consciously work to use blue to lure others in. Blue can be a conscious element of a call to action in advertising. A blue button can be used to lure people to purchase online. (Blue links are blue for a reason, after all.) And, I think I’ll make certain to wear blue whenever I have an important presentation to make. What are your thoughts? What are some other ways we can capitalize on the lure of blue? *Read the New York Times article here. OK, it’s confession time. I have been a loyal Starbucks customer for almost twenty years. Nearly every morning, I start my day with a “tall dark roast for here.” I usually enjoy it in a mug on site at whichever Starbucks location is closest to where my work (or weekend fun) takes me on any given day. Surely, Starbucks must have many customers just like me – customers who aren’t interested in a fancy brew – just a consistently good cup of coffee. Starbucks should be commended for this accomplishment. The company has never lost sight of its core product: a simple cup of coffee. What do you think? Do you know of any other product or service provider as consistent as Starbucks is? Is there another product or service to which you’re as fiercely loyal as I am to Starbucks? I’d love to hear from you via the comment area below. P.S. I am secretly proud that a “tall dark roast for here” is still my morning drink of choice. I enjoy starting the day simply. Bravo, Starbucks! I saw the new Renoir biopic yesterday. It’s a gorgeous, graceful film that tells the story of artist Pierre-Auguste Renoir’s later years spent in the south of France at Les Collettes, a farm at Cagnes-sur-Mer, close to the Mediterranean coast. The film is lusciously filmed, acted and written. Every frame is ripe with symbolism. The soundtrack, replete with the chirping of birds and gentle breezes, fittingly sets the stage for Renoir’s daily ritual of painting en plein air. 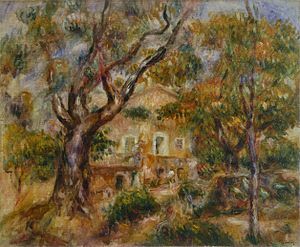 By that time is his life, the early 1900s, Renoir was suffering from the effects of rheumatoid arthritis. His hands were swollen, gnarled and barely usable. In order to work each day, he had to have his brushes strapped to his bandaged hands. Barely able to walk, he was confined to a wheelchair. He and his wheelchair had to be carried to the location where he wanted to paint each day. It took four people to make this happen. Since Renoir regularly preferred to paint far out in a field, the woods or a hidden cove near the sea, those morning rituals made for dramatic visuals in the film. Renoir had a process to creating his art. That process certainly involved nearly a lifetime’s ritual of painting every day — no matter where he lived, no matter the weather and no matter how poor his health. Beyond that, I don’t think he was able to define his process. It was as if he intuitively knew what to do. There were a couple of moments in the film in which he tried to explain to one of his sons the process of mixing pigments to achieve a desired effect. He encouraged his middle son to “Visit the Louvre” to learn about art and about life. And, Renoir referenced the 16th century Venetian artist, Titian, several times in the film, so we can assume that Titian was a strong influence. But mostly, Renoir seemed to leave a person on his or her own, knowing that each of us is our own best teacher. This Renoir film made me think about process, specifically the design process. Perhaps process is overrated today. Perhaps we’d all be better off going back to Renoir’s way of just getting out there and doing. Doing every day, day after day, for a lifetime. Rather than spending hours, or even days, attempting to define the process, perhaps we could accomplish more just by doing, learning, doing, learning and doing some more. Maybe process really is just that simple. Renoir seemed totally comfortable with this no-process process. And, lucky for us, the quality and quantity of his work didn’t suffer one bit.